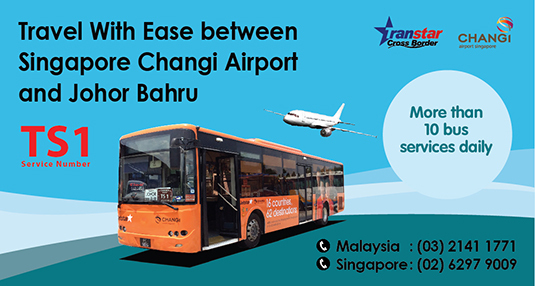 Transtar Cross Border bus service offers great convenience for all travellers traversing between Changi Airport and JB CIQ. The bus journey takes around 1.5 hours depending on traffic conditions, especially at respective Customs. Besides, there are 12 bus services operating on daily basis in order to meet the demand of passengers travelling from Singapore Changi Airport to JB CIQ. Commuters can easily board buses from Johor Bahru CIQ bus terminal. After arriving at CIQ, there are plenty of taxi and city buses waiting to take you to your desired destination. The first bus of Transtar Cross Border departs from Changi Airport to Johor Bahru CIQ at around 8.15am. Whereas, the first bus leaves from Johor Bahru CIQ to Changi Airport at around 5.00am. The last bus departures at Changi Airport and Johor Bahru CIQ are scheduled at 11.15pm respectively. Transtar Cross Border promote smooth bus services across a number of city routes. It provides well-integrated buses and friendly staff who consistently looks after the requirements of passengers during the journey. The Pick up points at Changi Airport are Terminal 2 at the Arrival Hall Coach Bay Lot 9 / 10 and Terminal 4 at the Arrival Hall Coach Bay Lot 8. Any category of buses run by Transtar Cross Border ensures comfort and travel convenience at all times. In case of any queries passengers can easily approach the Transtar Cross Border Counter which operates daily from 10am to 7pm. It is located at the Arrival Hall of Terminal 2. To travel with Transtar Cross Border, log on to redBus.sg and book your bus ticket to your destination. Now redBus customers can securely book Transtar Cross Border tickets with debit card, credit card and net banking. All passengers are eligible to ongoing time to time deals and offers and make sure they have a discounted journey with us.